Northern Norway stretches over almost 113,000 square kilometres, so it’s no surprise that you might feel a little lost trying to decide where to visit and trying to create an itinerary for your trip! Fortunately for you, I’ve had the chance to travel quite extensively between Norway’s northernmost village and Saltfjellet - the mountain range that sits right on the Arctic Circle - during the 3 years I’ve lived in Northern Norway myself. In this article, I’ll thus present you with 3 different itineraries for a trip to Northern Norway (in summer or winter!) lasting from 4 to 7 to 10 days. In order to truly make the most of a trip to Northern Norway, I always recommend people to stay as long as they possibly can. I totally understand that it doesn’t make much sense to stay in the area for 10 days when you only have 14 days to spend in Norway (or Europe for that matter), so 4 days really is the minimum. That way, you’ll have a decent enough chance to see the Northern Lights when visiting in winter and get to cover quite a lot of ground during the summer when there’s 24 hours of daylight. If you only have 4 days to spend in the area, there really is only one place that’s suited best as a base: Tromsø! The city has experienced quite a tourism boom over the last decade, so there’s an abundance of activities, sights and tours for you to choose from. This being your arrival day, you probably won’t have the whole day, meaning you should probably start your time in the city with a stroll around the city centre and a trip up Mt Storsteinen with the cable car at Fjellheisen. I don’t know about you but I always like to get an overview of the place I’m visiting from above and the view of Tromsø from the upper cable car station is probably unlike anything you’ve ever seen! If you’re visiting in summer, you can go on a short hike from the station to the top of Mt Fløya for an even better view and a truly Norwegian outdoor experience. The hike takes around 1 1/2 to 2 hours and despite some quite steep and rocky parts, it’s one of the easiest (and easily accessible) mountain hikes you can go on in Tromsø. Thanks to the midnight sun, you can do the hike in the evening and then have a bite to eat at Fjellstua cafe at the cable car station afterwards, before taking the cable car back down again (the last ride down during the summer departs at 1am, so you have plenty of time). When visiting in winter, a hike in the mountains is just plain dangerous and not something I’d recommend. You can still take the cable car, of course, but make sure to stick to the viewing platform and don’t venture too far out on the mountain plateau (and don’t leave the designated trails). Make sure to head back to the city early enough to have dinner (you’ll find all my favourite restaurants in my e-guidebook to the city) and change into something even warmer, before embarking on your first Northern Lights safari! Tromsø isn’t exactly a big city, so you can easily spend your second day exploring more of the city’s cultural scene and venture out into nature. If you’re interested in museums, you might want to visit the Polar Museum to learn more about Arctic explorations of the past, Tromsø Museum to learn more about the Sami people and Arctic nature, or Perspektivet and the Northern Norwegian Art Museum if you’re into photography and arts. Museum visits can make you quite tired and hungry, so make sure to stop by some of the city’s cosiest cafes! If you love the outdoors more than culture, make sure to check out what the city of Tromsø has to offer in terms of nature itself. There are plenty of scenic spots and hiking trails available on Tromsø island, meaning, you don’t have to venture far to experience the Arctic landscape (and you don’t even have to rent a car if you don’t want to, as all places on the island are easily accessible by bus). These spots are all great for trying to spot the Northern Lights as well, should you not want to spend money on a tour 3 nights in a row! For more tips on hunting the lights on your own, make sure to check out my e-guidebook to Tromsø here. Afte 2 days in Tromsø, you should have pretty much seen all the city has to offer itself, so now it’s time to venture out to the surrounding areas. In summer, the best way of doing so is to rent a car, even if just for the day. I’d highly recommend you to go on a road trip to the neighbouring island Kvaløya, where you find quaint Northern Norwegian villages by the fjord (such as Ersfjordbotn and Kaldfjord), the biggest sandy beach in the area at Grøtfjord, as well as ancient rock carvings and an open-air museum with a view at Hella. Note: Even though the landscape on this road trip is incredibly scenic and you might want to stop to take pictures all the time, make sure to not just stop in the middle of the road or on a narrow/curvy stretch (I wish this would be obvious but locals complain about tourists behaving like this all the time so don’t be one of them). During summer, there are also lots of reindeer on the roads, so drive carefully! You’ll find more road safety tips and local regulations for Norway in my e-guidebook to Tromsø. In winter, a road trip might be equally scenic but way more dangerous - especially if you’re not used to driving on snow and ice! Instead, and especially if you’re visiting between November and January, I’d recommend you to go on a whale watching safari/fjord cruise! While the whales in previous years were based right off the coast of Kvaløya near Tromsø, they now seem to have made Skjervøy their home for the winter, which is a town that’s almost 4 hours away from Tromsø. Nonetheless, you can still go on a boat excursion to see the whales - only difference being that while those tours previously lasted 4 hours, they now last between 5 and 7 hours. That means, you’ll be out and about for most of the day, but still have some time left in the evening to go on another Northern Lights safari or maybe try dog-sledding. Before booking an experience involving animals, though, make sure to read this! Departure day! Depending on what time you leave, you might be able to cram one last activity into your schedule: a spa cruise maybe? Feeding reindeer? Visiting the aquarium and watch the feeding of the seals at Polaria? Go and see the Arctic Cathedral up close? Or maybe you just want to go on a last hunt for souvenirs? Whatever you decide to do in the end, chances are that Tromsø will leave you in absolute awe and you’ll want to come back before you even left! You’re really spoiled for choice when staying in Tromsø as there are plenty of options for every budget. Ideally, you want to stay in the city centre (or very close to it), though, as that’ll make explorations a little easier, but even if you decide to choose an Airbnb that’s not directly in the city centre, chances are that there’s a bus stop nearby and you don’t have to spend more than 5-20 minutes to get into town. If you’d rather stay somewhere scenic, check out Tromsø Lodge & Camping. The campsite offers several different cabins that are either very cheap or very luxurious depending on what kind of cabin you choose. And even though the campsite is situated on the mainland and not on Tromsø island, it’ll only take you 15 mins to get from your cabin into town by bus. An entire week in the Arctic - now we’re talking! While 4 days are great to get an introduction to the region, you won’t be able to travel around a whole lot. With 7 full days in the area, however, you can combine at least 2 different regions and that way really cover a lot more ground! Bodø and the Lofoten Islands! Now, the Lofoten Islands are a no-brainer I guess, as everyone seems to want to visit these days and the region really is worth a visit! To me, the Lofoten Islands really are Norway in a nutshell in as much as they offer everything you’d expect to find in Norway: from mountains and fjords to lush farmland, sandy beaches, and a rugged coastline. Bodø on the other hand is still often overlooked in favour of Tromsø. As I’ve described in a previous article, though, the two cities are actually quite alike and even though Bodø is smaller than Tromsø, it offers plenty of sights and cafes/restaurants, as well as stunning landscapes that are hard to beat! In contract to Tromsø, though, I wouldn’t recommend visiting Bodø and the Lofoten Islands in the dark winter (November to January), as the region is best suited for those that want to explore Norwegian landscapes and nature - which, you won’t be able to see properly if there’s only 4 hours of daylight... Therefore, I’d recommend this itinerary for anytime between May and October. While you can, of course, visit Bodø and the Lofoten Islands in winter as well, you won’t be able to do the hikes mentioned below and if you’re not used to driving on snow and ice, the narrow and curvy roads of the Lofoten Islands will just pose an unnecessary danger to you and then in turn, everyone else. Fly into Bodø as early in the day as possible and check into your accommodation. While Bodø is super walkable and you’ll find plenty of Airbnbs in the city, you’ll get the best view in town if you stay at Scandic Havet right by the harbour! Use your first half-day to get acquainted with Bodø: Go for a stroll along the pier and harbour, go on a photographic hunt to check out all street art in town, and if you have some time left, visit the Norwegian Aviation Museum. There you’ll get to learn all about Norwegian aviation history, take in the view of Bodø from above from the control tower or try out the flight simulator (though, the latter isn’t exactly budget-friendly - but fun for sure!). 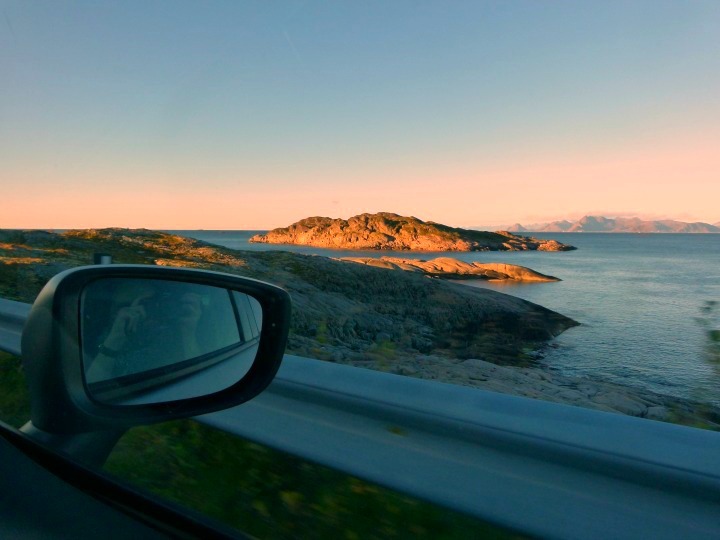 The best way to truly experience what the Bodø region has to offer, is by renting a car. On your second day in Bodø, make your way to the peninsula Kjerringøy where you should visit the old trading post turned into open-air museum. You’ll get to learn all about the local fish trade here and the place is just so scenic that it might just be worth the trip for the views alone. Make sure to also stop by Mjelle on your way to or from Kjerringøy. Mjelle is a local bay with plenty of beaches - among others, a purple one! The beach there is made up of white and red sand which lets the beach appear purple under the right conditions. It’s a bit of a walk to get to Mjelle but the landscape is super scenic, so I’m sure you won’t mind. And if that isn’t enough for you, you could also embark on a longer hike from Mjelle to get to Hovden - a beach with ocean access from both sides. This hike is not for the inexperienced, though (and also not suitable in winter), and takes around 4 hours. If you’re looking for an easier hike, make your way back to Bodø after visiting Mjelle and follow the hiking trail that leads up a set of sherpa stairs to Keiservarden from where you have a fantastic view of Bodø from above! Note: If you don’t want to rent a car, you can also book hiking trips, both to Hovden and Keiservarden via Visit Bodø. Today is the day to embark to the Lofoten Islands! If you decide to visit here, you absolutely do need a car in order to really get the most out of your visit. You can either rent a car in Bodø for your entire stay and bring it on the ferry or Hurtigruten cruise (which makes the ride more expensive), or you can take the express boat from Bodø to Svolvær (which also isn’t exactly cheap) and rent a car in Svolvær instead. The express boat between Svolvær and Bodø (at the time of writing) costs 668 NOK per person, while the ferry between Moskenes and Bodø costs ca. 1200 NOK for a car and one driver (1400 NOK if you’re 2 people). The Hurtigruten cruise costs around 450 NOK (without car and in off-season/ca. 570 NOK during the summer) but takes 6 hours as opposed to the 3 hours of the express boat and ferry. As all 3 boats depart in the late afternoon/evening, you still have a bit of time left in the morning to explore more of Bodø. I’d suggest heading out to Saltstraumen - the strongest tidal current in the world. The easiest way to get there is by car but there are also busses available - make sure to check the timetable in advance, though, so as not to miss your ferry. The best time to visit Saltstraumen is at high tide, so make sure to also check the tide times before you go! Assuming you arrive in Svolvær, you should use your first day in Lofoten to explore Austvågøy and Vestvågøy (if you arrive in Moskenes first, just make day 6 of this itinerary your first and day 4 your last day)! Luckily it’s quite easy to get around in the Lofoten Islands and even though you could easily spend an entire week in the islands alone, you could also just check out the highlights of each island. The islands of Austvågøy and Vestvågøy in the North can easily be explored in one day by going on a road trip. Before you embark on your road trip, make sure to go for a stroll around Svolvær as the town itself is just absolutely beautiful! In order to save time, I’d also only spend 1 night in Svolvær and base myself closer to Leknes for the second night, in order to save time the next day - for instance in scenic Ballstad! Day 5 is all about exploring Flakstadøy at first. Head to the scenic fishing village of Nusfjord for a wander and photo session, before heading up to Ramberg for lunch at the local cafe or guesthouse, as well as a stroll at the scenic beach. In the afternoon, I’d head over to Moskenesøy to explore another quaint little fishing village: Hamnøy. I’d base myself in Reine for the night but before heading there, make sure to stop at Olenilsøya kystfort for even more scenic views (as if you couldn’t find those around every corner in Lofoten, though - lol). After all that time driving around, it’s time for a hike, don’t you think? Most people visiting Reine embark on the hike to Reinebringen, which, arguably, offers amazing views of Reine from above. The trail is only 1 km long but it’s quite steep and slippery, so definitely wear proper hiking boots if you attempt it. As the trail is super popular (thanks Instagram…), it’s under construction every now and then as a team of sherpas is still in the process of building stairs into the mountain. Because it’s so popular, though, the trail is also becoming increasingly dangerous to the point where some news outlets recommend you to stay the hell away from it. I haven’t hiked Reinebringen personally, but I know for a fact that the Lofoten Islands have other equally stunning hikes to offer. So if you’re not into hiking where everyone else hikes (or especially if you’re visiting in July when the Lofoten Islands are insanely crowded), consider visiting Brunakseltinden, Trolldalsvatnet or Svartvatnet instead. It’s time to head back home. If you plan to rent a car in Svolvær and want to follow this itinerary, make sure to head back to Svolvær to return your car (you can’t leave it in Moskenes) after your hike on Moskenesøy on day 6 as the Hurtigruten cruise departs for Bodø at 8.30 pm in the evening, while the express boat departs at 6.30 am the following day and arrives in Bodø at 10 am. If you decide to rent a car in Bodø, you’ll arrive and depart from Moskenes, meaning that the ferry to go back departs at 7 am and arrives back in Bodø at 10.15 am. In either case, make sure to book a flight connection that leaves past 1 pm, so you have enough time in case of bad weather on the ocean and to get to the airport. As mentioned previously, Scandic Havet is a wonderfully scenic option in Bodø but if you’re on a budget, City Hotel Bodø offers basic but quite cosy rooms close to the ferry terminal that only cost around 600 NOK. In Lofoten, I can highly recommend you Lofoten SuiteHotel for their amazing views from their rooms, and Scandic Svolvær for the incredible breakfast buffet! You also can’t really visit the Lofoten Islands without staying at the traditional fishing huts - for example at Hattvika Lodge in Ballstad, or Lofoten Bed & Breakfast and Reine Rorbuer in Reine. If you have 10 days available to explore Northern Norway, you’re really up for an amazing holiday! You could cover a lot of ground and go on a road trip to explore as much as possible, but if I were you, I’d divide my time between 3 to 4 areas to really explore those properly. With 10 days available, you can easily follow the first 2 itineraries presented above, with a few minor adjustments - meaning, you could (and should) visit Tromsø, Bodø and the Lofoten Islands! If you’re following this itinerary in spring/summer, you could also visit the gorgeous island of Senja along the way! Fly into Tromsø and follow day 1 and day 2 of the first itinerary presented in this guide. 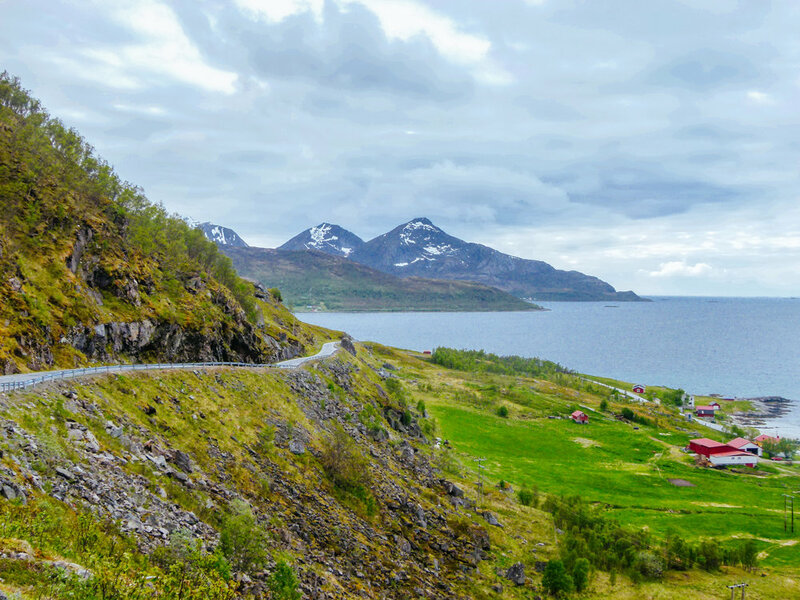 Rent a car for the day and embark on your road trip early, so that you get to at least see Ersfjordbotn and Sommarøy as described in the first itinerary above. Then make your way to Brensholmen to catch the ferry to Botnhamn on Senja (which only runs between April and August!). On Senja, you should definitely check out the beautiful beach at Ersfjord (Ersfjord, Senja - not to confuse with Ersfjordbotn, Kvaløya), the wooden walking trail at the coast at Tungeneset, as well as the viewing platform at Bergsbotn. Make sure to bring food and drinks for a picnic as you won’t find many cafes or restaurants along the route. When returning back to Tromsø via Kvaløya, make sure to take the “southern” route to experience the rock carvings and open-air museum at Hella before getting back to the city! Time to head south! You can either take the plane from Tromsø to Bodø and follow the second itinerary of this guide by either cutting one day in Bodø or one day in Lofoten, or you can take the Hurtigruten cruise from Tromsø to Svolvær. I’d recommend you to do the latter as the cruise is incredibly scenic and you’ll get to experience the Vesterålen Islands, as well as gorgeous Trollfjord on the way as well! As you’d have to board the Hurtigruten at midnight, you’ll get one more day in Tromsø and can follow the suggestions of the first itinerary above or head here to find out what there’s to see and do in Tromsø for free! You’ll arrive in Svolvær in the evening of day 5 and can rent a car in town in order to explore the islands on day 6, 7 and 8, before returning the car where you picked it up and take the express boat to Bodø, where you’ll get about 1 1/2 days to explore before flying back home. Make sure to read itinerary #2 above for more information on what there’s to see and do in Bodø and the Lofoten Islands! Older PostNew Year, New Name - Welcome to Nordic Wanders!